Vivid and dramatic episodes depicted by writers of the day and popularized in subsequent films, books, and television programs do have foundation in fact. . . . THE PROSPECTOROn the clear, chilly morning of January 24 1848, James Marshall and his work crew were camped on the American River near Sacramento constructing a saw mill for John Sutter. Marshall found some tiny gold nuggets. Soon after, General John Bidwell discovered gold in Feather River, and Major Pearson B. Reading found some in Trinity River. As news about the nuggets spread, the Gold Rush was on. On the 150th anniversary of Marshall's discovery, the Oakland Museum of Calif. unveiled exhibitions -- parts of which are on-line -- entitled Gold Rush! California's Untold Stories. Geographical and cultural isolation gave rise to a peculiar type of organized crime known as the bandit gang. In the vastness of the region, these organized groups of outlaws sought refuge from law enforcement. . . . Violent feuds between cattlemen and sheepmen also developed and the results culminated in some very famous gunfights. . . .[Combating] the rustling of cattle and horses became an important enforcement function for the Wild West sheriff. When gold and silver was discovered in California, Colorado, Montana, and elsewhere, beginning in about the middle of the nineteenth century, the picture of the West changed dramatically. The most obvious change was the dramatic influx of population. . . . In many mining camps they elected a presiding official, a claims recorder, and often times a judge and a sheriff to deal with the various issues of control and enforcement. The transportation of people, goods, and money on stage coaches and trains fell prey to road agents who would strike out against the vehicles in secluded areas. The spacious territory and lack of communications made it extremely difficult for sheriffs to track down these outlaws. The hold-ups of these transit lines became so pervasive that the companies eventually hired private security and armed guards to accompany passengers and payroll that were being transported throughout the frontier. 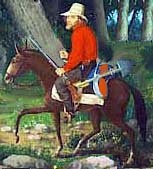 Horse stealing in the West was also widespread and was considered a serious offense. It was often times judged even more serious than shooting a man and horse thieves routinely were hanged for the offense . . . .No analysis of crime in the Wild West can be made without references being made to the courts of the era. While the majority of Western judges probably had the best intentions and wished to uphold the highest standards, the reputations of the courts did not always reflect this. Confronted with serious issues of crime, disorder, vice, and violence, the pioneers of the old West turned to members of their communities to enforce order. With a multi-century background and history, the office of sheriff was a natural addition in this environment. Selection could be made by appointment, or in most cases by popular vote from community residents to select a sheriff. The county-wide jurisdiction of the office fit very nicely in the law enforcement efforts and supervision of the vast countryside. The ability of the sheriff to respond to the hue and cry and to raise a posse helped greatly with the issues of crime and the isolated nature of the frontier. The office that had evolved over the centuries was a "hand in glove fit" for local law enforcement in the Wild West. MANDATED SHERIFFSThe First Republic of Texas Congress assembled at Columbia on Oct. 3, 1836: 29 representatives and 14 senators. Besides providing that each of the 23 counties have a sheriff, a coroner, justices of the peace, and constables to serve two-year terms, the Congress adopted a flag and a seal for the new republic. Congress decreed that the seal be circular with a single star encircled by the words "Republic of Texas." Later Texas national and state seals modified the design but the lone star stayed. The first national flag had "an azure ground, with a large golden star central." It was redesigned in 1839 to have a blue vertical stripe with a five-pointed white star and two horizontal stripes of equal width, the upper white and the lower red. Source: The Handbook of Texas Online, a joint project of the General Libraries at the University of Texas at Austin and the Texas State Historical Association. "There shall be appointed for each county, a convenient number of Justices of the Peace, one sheriff, and one coroner, who shall hold their offices for two years, to be elected by qualified voters of the district or county, as Congress may direct. Justices of the Peace and sheriffs shall be commissioned by the President [of the Republic]". The provisions of the Constitution remained unchanged and the Texas laws endured through the Civil War and Reconstruction period. With minor exceptions to the term of office and removal clauses, the office of sheriff continues in the State of Texas largely as it was in 1836.In other regions of the West, these developments ran parallel to the Texas experience. . . . Newer legal provisions varied but essentially statutes called for an elected sheriff to be the primary police agent for the organized county governments. Terms usually varied between two and four years and a variety of checks and balances were placed providing for the removal of an official. "When any felonious offense shall be committed, public notice thereof shall be immediately given in all public places near where the same was committed, and fresh pursuit shall forthwith be made after every person guilty thereof by sheriffs, coroners, constables, and other persons who shall be by any of them commanded or summoned for that purpose"
Wyoming allowed for sheriffs to use a residence for his law enforcement purposes at county expense. New Mexico extended jurisdictional limits of the sheriff to permit him or his deputies to enter all counties in the state to affect an arrest and to have concurrent rights of posse comitatus in every county. While the duties of sheriffs and their deputies were multitudinous, the primary law enforcement functions were virtually identical throughout the early West. . . .
As chief law enforcement officer of the county, the sheriff performed diverse duties. In many jurisdictions he served as tax collector, similar to the duties of the colonial sheriff. Also in contrast to its colonial forerunner, the sheriff had to administer corporal punishment, as directed by the courts. The sheriff often times was required to carry out the sentence of death. Rustic executions in the Wild West were performed primarily by hanging an offender. Sometimes sheriffs constructed formal gallows for this purpose, and other times a rope was simply tossed over a stout tree limb to accomplish the execution. Other duties of the office were rather mundane and involved the service of process or other civil enforcement functions . . . .
Never hit a prisoner over the head with your pistol, because you may afterwards want to use your weapon and find it disabled. . . .
Never attempt to make an arrest without being sure of your authority . . . When you attempt to make an arrest [of] a desperado, have your pistol in your hand or be ready to draw when you make yourself known. . . My motto has been, "It is better to kill two men than to allow one to kill you". After your prisoner is arrested and disarmed, treat him as a prisoner should be treated - as kindly as his conduct will permit. You will find that if you do not protect your prisoners when they are in your possession, those whom you afterwards attempt to arrest will resist you more fiercely . . .
Never trust much to the honor of prisoners [your safety or their custody]. . . Nine out of ten of them have no honor.